This morning Tunisian Prime Minister par interim Caid Essebsi gave a law and order speech that attempted to calm the country in advance of elections, now just 6 weeks away. Essebsi’s speech called on the security service to maintain order throughout the country, in particular through the application of the state of emergency law. Under the emergency law, the government has the right to forbid sit-ins and strikes, something that has become increasingly common in Tunisia since the revolution of January 14. Essebsi’s speech came on a day when police officers staged a protest (some call it a sit-in) in central Tunis. The Prime Minister confronted the police by calling their labor union illegal and ordering their return to work. Bloggers in Tunisia have reacted so far with alarm at some of these measures, which they see as directed against protest movements that have received a heavy-handed reaction by the ministry of the interior. Most recently, an August 15 protest by magistrates was marred by violence from police officers (including plain-clothed officers) and heavy use of tear gas. Many politicians will be disappointed that Essebsi did not call for a simultaneous referendum with the election of the constitutional assembly aimed at ensuring a popular vote on the nature of the next government (parliamentary versus presidential). The PM mentioned attacks that have occurred around the country in recent days, resulting in several deaths and serious injuries in clashes between security forces and malfaiteurs. It is unclear who exactly is behind the violence, many blame former partisans of deposed president Ben Ali, while others blame the situation on general lawlessness, including the release of hundreds of violent criminals during the height of the revolution. Whatever the cause, Tunisians are worried about the security situation as well as the general chaos that has enveloped the country. Despite a return to relative stability in the capital, residents must face many new worries, from the malign to the mundane. Garbage worker strikes have made the once (mostly) clean capital, a visibly dirtier and less sanitary environment, while homeowners have to increasingly deal with break ins and vandalism to property. Support for sit-ins and strikes has dropped dramatically in the most recent poll by the Tunisian press agency. Essebsi’s move corresponds to an increasing feeling among Tunisians that the situation of the country is out of control and that the government must take control. The interim government is in a difficult situation. Lacking a mandate to govern, but with extremely high expectations from its citizens, it has struggled to hold together until the October elections. Essebsi’s speech today is the government’s latest attempt to buy time until the elections. 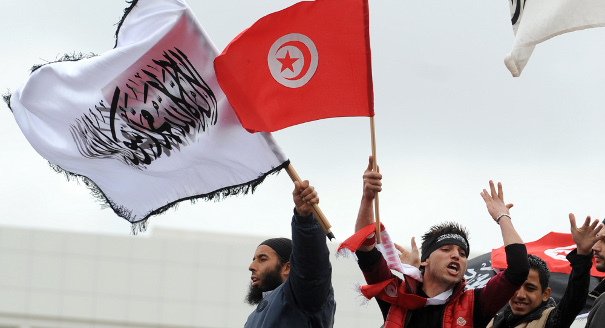 While it will surely arouse suspicions from the Tunisian activists and opponents outside the government, it clearly is aimed at addressing the anxieties of a population hoping for greater peace and stability in their lives.